64 of Ewa Beach passed away on March 6, 2018 in Ewa Beach. She was born in Talomo, Davao City, Philippines. 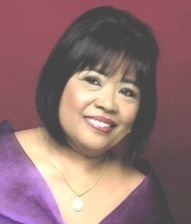 She is survived by her husband James Ilae, Jr.; daughter Priscilla Ilae; mother Anita Acol; brothers Danilo Acol, Alfredo Acol, Noli Acol; sisters Evelyn Akaki, Marjorie Bicoy, Yolanda Schnell, Clarita Acol; grandchildren Haylee Sorrow-Ilae, Taylor-Ann Sorrow-Ilae, Jewel Ribucan-Babb. Visitation will be 6:00 pm Monday May 14, 2018 at Mililani Memorial Park and Mortuary's Mauka Chapel followed by wake service at 6:30 pm and program at 7:00 pm. Second day visitation will be 8:30 am Tuesday May 15 2018 at Mililani Memorial Park and Mortuary's Mauka Chapel followed by prayer service at 10:00 am and program at 10:30 am. Burial will be 11:00 am Tuesday May 15, 2018 at Mililani Memorial Park Cemetery. Casual attire. Flowers welcome.